The South Australian shore from Kangaroo Island to Ceduna boasts a multitude of white sand beaches, deserted islands, and sheltered bays – truly one of the undiscovered gems of the Australian coastline. Our Southern Safari cruise is a stylish exploration of this area, with a unique mix of adventure, history, relaxation and excitement. It is also a gourmet’s delight – we sample the food and wine from McLaren Vale, and the True North chefs facilitate your indulgence in bluefin tuna, Coffin Bay oysters, King George whiting and blue swimmer crabs onboard the ship as we make our way west. 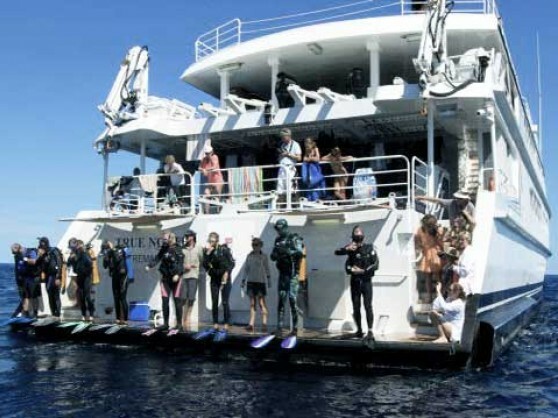 There is plenty to get the heart racing too, including a cage diving with the Great White Sharks at Neptune Islands, snorkelling with the ‘tuna cowboys’ at Port Lincoln, and frolicking with the seals at Stokes Bay. Enjoy a picnic on a deserted beach with only penguins for company, or try your hand at fishing for snapper and flathead. Hike to the top of Pearson Island, or take in the view from our sightseeing tenders as our local guides point out the abundant wildlife. 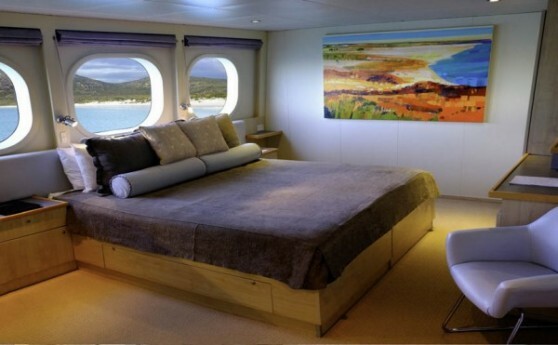 Start your cruise with a difference! Our luxury coach will collect you from your Adelaide city accommodation. Then sit back and relax as we complete the short journey to the famed McLaren Valley wine region. The Valley’s favourable climate and geographical influences have resulted in a thoroughly deserved reputation as one of the ‘safest’ places in the world to grow grapes. And, you will not be able to resist the local grower’s commitment to excellence in fruit production. Small and large producers give the highest priority to maintaining the distinctive characteristics that emulate from the region’s various micro-climates and, the careful control of water application ensures fully ripened grapes that provide winemakers with fruit of great flavour. The region’s restored Shiraz vines now produce truly great Shiraz that consistently wins top awards around the world! First stop is the funky Red Poles art gallery. Enjoy some morning tea midst the vines and wind your way through the gallery exploring the latest art. Then it’s onto another stop with a difference – the Lloyd Brothers’ olive grove. Here’s an opportunity to sample some of the country’s best Kalamata olives, oils and pestos. Then it’s down to business – wine tasting business that is! Select your preferred wine at our feature winery and then savour the first of many dining delights as the cellar kitchen presents opening fare with emphasis on fresh and often quirky local produce! After lunch a scenic drive will deliver you to Wirruna Cove and the delights of the TRUE NORTH. 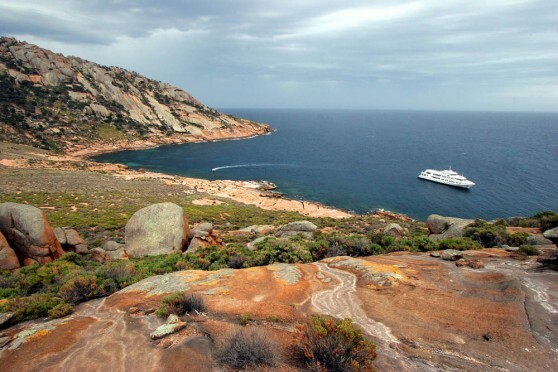 Enjoy a welcome aboard cocktail, settle into your cabin and indulge in more culinary delight as we begin the evening cruise to Kangaroo Island. Kangaroo Island has been described as “one of the earth’s last unspoilt refuges” and more recently the island has developed a reputation as being one of the “Big 4″ Australian tourism events – Sydney Harbour, Ayers Rock , The Great Barrier Reef and, Kangaroo Island! Much of the islands native bushland remains undisturbed and more than a third of the island has been set aside for conservation. And the ‘locals’ include some of Australia’s most distinctive characters – koalas, platypi, echidnas, sea lions, penguins, goannas, kangaroos, emus and wallabies. Kangaroo Island is also distinctly beautiful featuring pristine beaches, rugged coastal cliffs and sleepy seaside cottages. After an early breakfast, we head ashore for a ‘road- trip’ to the island’s south-western tip and, the Flinders Chase National Park. The natural sculptures that are Remarkable Rocks provide a unique setting for morning tea. Stunning scenery surrounds the boardwalk to The Admirals Arch and there are several vantage points to view the local seal colonies. Then rejoin the TRUE NORTH at Kingscote and savour a lunchtime cruise to American River. In the afternoon there will be ample opportunity to explore in and around this quiet fishing village. But it’s neither American, nor does it have a river. The village is named after a group of American sealers who landed here in 1803 and then mistakenly referred to a narrow inlet as a river. The area is renowned for bird- watching and it’s also a great spot to wet a line! Best of all – American River provides us with a stunning and tranquil overnight anchorage. Today we explore Kangaroo’s stunning north coast – where farmlands roll onto deserted sandy coves. 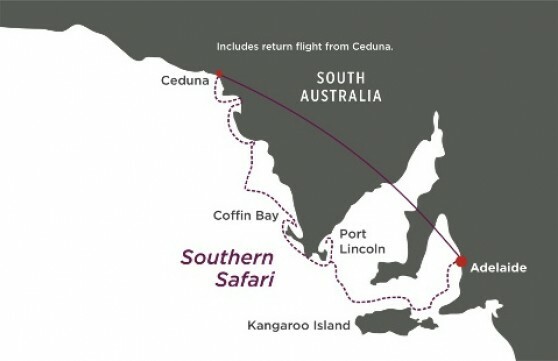 Visit Emu Bay, Stokes Bay, Cape Dutton and Cape Forbes. Fill your day with snorkelling, beach combing and close encounters with seals and dolphins. Fishing for ‘monster’ whiting will also be a popular activity! Have you ever wanted to cage dive with great white sharks – well this could be the opportunity that you have been waiting for! Join our experienced local operator for a once in lifetime opportunity to see huge white sharks up close and in their natural environment. An experience that you will not forget! If diving with white sharks is not exactly your ‘cup of tea’ – there will be ample opportunity to engage in activities somewhat less confronting as we explore the Gambier Islands. Perhaps its time for a spot of fishing in a secluded bay! Our guides are practised at introducing local fishing techniques to both the beginner and expert alike! 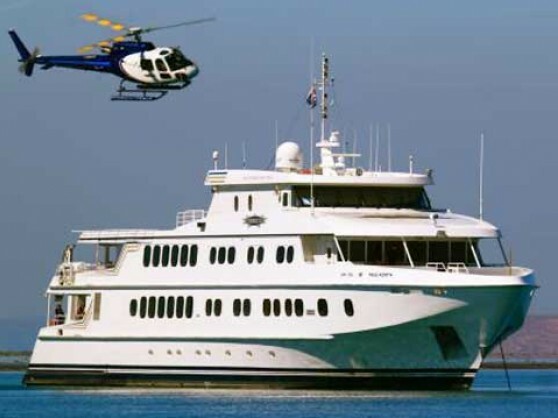 And with multiple expedition vessels at our disposal – take advantage of small groups and personal assistance. Target species in-close include delectable whiting and out deep, ‘double-headers’ of pink snapper are not uncommon. Our schedule will also include morning and afternoon sightseeing excursions – our knowledgeable guides will be happy to introduce local history and geography. Port Lincoln is a major tuna fishing area and in recent times the industry has generated vast wealth on the back of a lucrative Japanese market. The prices paid for high-grade tuna can be very spectacular indeed – fish prepared specifically for the sashimi trade can command in excess of $150,000 per tonne and as a result, many of the local fishermen have become millionaires. Fish farming has also become an important local industry – tuna, kingfish, mussels, oysters, abalone and lobsters are all ‘grown’ locally and a visit to the area would not be complete without experiencing a ‘tuna rodeo’. Workers on the tuna farms are called “cowboys” and once you see their unique fish handling techniques you will understand why! Our guides will provide an entertaining introduction to local commercial fishing and aquaculture and, don’t miss a unique opportunity to swim with giant southern blue-fin tuna! In the afternoon join everyone ashore for a tour of Port Lincoln itself but make sure you’re back onboard just before sunset – a sashimi ‘tasting’ will be a fitting end to the day’s activities. Wake this morning in beautiful Coffin Bay. The area is widely admired for its pristine beauty – endless tranquil bays fringed with brilliant sandy beaches and surrounded by national park. And more recently the area has also developed a reputation for producing succulent oysters! Take a hike in the Coffin Bay National Park; visit the Coffin Bay town site, the fully restored Mount Dutton Bay woolshed and the Kellidie Bay oyster leases. And something special again today! Join the crew ashore for a beach picnic on Gallipoli Beach – a beach with striking similarities to a far away coast and, setting for the film “Gallipoli”. After lunch enjoy a leisurely cruise to Greeny Island – blue water home to schools of monster tuna, huge samson fish and giant yellow tail kingfish! Take a relaxing cruise around the island before indulging in some Coffin Bay oysters – TRUE NORTH style! Welcome to the Pearson Islands – remote Islands on South Australia’s west coast that have changed little since they were first discovered by Matthew Flinders in 1802. They are well known for producing giant whiting however big Australian salmon and flathead are also common inshore. Out in the deep snapper, blue groper, bluefin and kingies will challenge the most determined angler! Explore the islands, have a swim on one of the many inviting beaches, visit the local seal colonies. At night the seals are known for catching fish attracted by the ship’s lights. Today we visit the Franklin Islands and nearby Saint Francis Island. For something a little different, you might be interested in joining one of our chefs for the morning – see how to catch, cook and prepare the revered blue manna crab. The islands feature many sheltered bays and millions of shearwaters that nest in shallow burrows. Spend the day exploring, fishing, snorkelling and diving as you prepare for your last night onboard the magnificent TRUE NORTH. Early morning disembarkation in Ceduna and light aircraft transfer to Adelaide.